Govt of India re-constituted Scientific Advisory Board(SAB) in Homoeopathy. Indeed a welcome decision but amazed to see a bunch of ‘Homoeopathic Beurocrates’ on board instead of researchers and related resources. It is unfortunate that some of them have been consistently shifting from one position to another on cessation of tenure on one post raising questions on possible nepotism. They seem fond to adhere within power circles in Delhi in spite of their contribution Homoeopathy being insignificant. Many seem to have no research background whatsoever. Some such old turks have stayed on SAB for a long time. One would wonder how would they add value or advise or monitor research-related activities in future when they could not contribute in past on the same status. 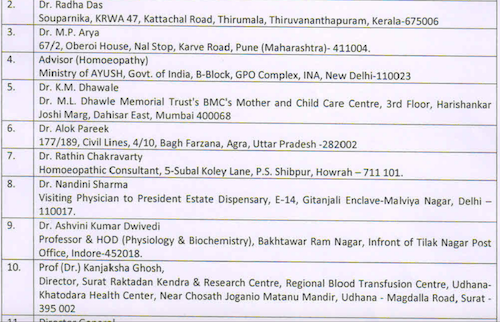 One could explore and compare the SAB of Modern Medicine (https://icmr.nic.in/sites/default/files/Circulars_front/NewCircular-2.pdf) and Ayurveda (http://www.ccras.nic.in/sites/default/files/viewpdf/2018_Scientific_Advisory_Board.pdf) – packed with researchers from top-class research institutes and Vice Chancellors of reputed Universities. These bodies come under the same Govt of India and it appears that the representing stakeholders of these fraternities have a clearer vision and goals of such core bodies and their ideation, desired influence and course of the research and academic dimensions while constituting the board with resources from wide areas in total consonance with the purpose. One could wonder what stops the deciding authorities in including scientists from major institutions and reputed universities in Homeopathy segment using such a great opportunity of inclusion. It shall certainly help in interdisciplinary research and PhD programmes in those universities as an outcome. Let’s hope, authorities will re-constitute this board, by including visionaries like Dr Khuda Bukhsh, Dr Papiya Nandi, Dr Girija Kuttan, Subash Gupta ,Dr Abhay Choudhary Director Haffkeins, Dr Rajesh Sha, VCs, NanoScience Experts, Experts from Physiologic Chemistry from IICT, Experts from Immunology etc.